Colony Courtship is back, and love is in the air! Hellbugs are everywhere, tearing Paradise apart. Take to the fight and slay every Hellbug you see, including the infamous Matron (this year, you might be seeing double)! Check for Colony Courtship arkfalls all over Paradise. 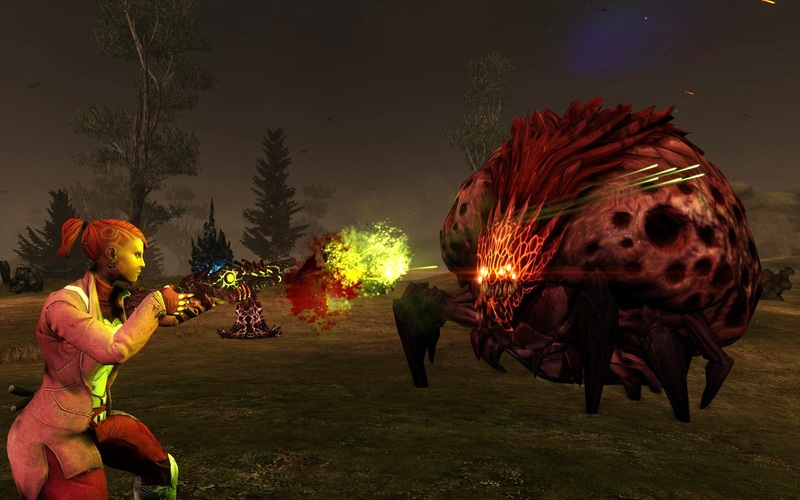 Complete the pursuit “Hellbug Apocalypse” to get the “Cupid’s Quiver” prototype! Modified to exploit enemy weak points, this shotgun fires large caliber slugs instead of a spray of pellets. Along with the hellbug menace, comes a new way to combat the dangers of the New Frontier: The Synergy Matrix! The Matrix Battery represents the raw power output of your matrix before being focused through crystals into the core. The Battery is powered by obtaining Matrix Battery Power (MP) from contracts or converted automatically from duplicate Synergy Crystals. The Battery is divided into 4 separate cells, each containing 25 levels of power. When a cell is maxed out, any MP obtained will be automatically converted into Chromatic Dust that can be used to purchase Expanders needed to unlock the next cell or additional items. The current strength of the equipped synergies is determined by your current Core Output. Core Output is how much of your total Matrix Battery Power (MP) is focused through each your equipped crystals. The higher your Matrix level, and the better the quality of your crystals, the higher levels of power you will be able to achieve. The power required to achieve each level of effectiveness can be viewed in the Synergy Info Screen. Each Synergy Crystal has a specific Synergy, rarity and gem type assigned to them. Each Synergy has a set of bonuses assigned to it, the more matching crystals of that set socketed, the more of those bonuses you will have access to, up to a maximum of 6. While a full six set bonus is powerful, the sets can be mixed and matched at will, creating unique combinations to fit your playstyle. The gem types indicate which color socket it can be socketed into, with only one crystal per color able to be socketed at a time. Obtaining a Synergy Crystal permanently adds it your collection in the Synergy Matrix. Once collected, crystals can be freely swapped in and out, and used in multiple loadouts. Only the highest Quality crystal of the same Color and Synergy will be kept, and any duplicate crystals of equal or lower rarity will be automatically converted into Matrix Battery Power (or Chromatic Dust if your matrix is maxed). The Ex Inanis have arrived on the New Frontier! These greedy beings of pure energy are stealing all of the Ark Tech from open world events! New players will be able to access some of these contracts right away. Higher level/power players will have even more contracts to complete than before! Ark chests have been removed from Arkfalls, Arkbreaks, and Co-Op Instances. They have been replaced by all new Ex Inanis Vendors. These Gulanee brokers will appear at the end of events and sell their wares to Arkhunters. A vendor will always spawn, but which vendor is anyone’s guess! Some vendors have special wares and higher rarity gear. Keep an eye out for some of these special vendors so you can get the best possible items! Higher tier Co-ops have a better chance for these rarer vendors to appear. Items on the Ex Inanis Vendors will always cost Gulanite and Purified Gulanite. Save up if you are looking for something specific! Class specs are now based on loadout rather than class. This allows for unique specs of the same class in different loadouts. Note: Changing classes within a loadout will require reallocation of class points. This change will cause all Class points to be reset and players will have to reallocate those points. Made a change to the Poultromancer prototype so that the Turkey spawn ability will only occur on Hit. This should reduce the number of turkeys players are able to spawn as an unintended consequence of the weapons functionality. Fixed an issue that would cause Melee attacks, regardless of how powerful they started out, to only break the shields on shielded or armored npcs. Now they will carry over the damage to the npc’s health pool just like every other attack. Fixed an issue with Manual Detonators not functioning correctly. Manually detonated grenade rounds will now detonate, when the correct input is pressed. Fixed an issue where Arkfalls and Cooperative Maps were not giving the proper amount of Raw Gulanite, upon completion. Players will now receive 1x Raw Gulanite for each Arkfall/ Coop completed. Fixed an issue with Poultromancer that was causing spawned Turkeys to deal large amounts of damage, incorrectly. Please note that the damage numbers displayed will still be incorrect, but that the actual damage being done is correct. A fix for the visual damage numbers displayed will be fixed in a later update. Fixed a number of issues that were causing crashes on all platforms. Fixed an issue causing weapons skills on enhanced weapons to gain and lose skill bonuses.